Currently the cheapest i can find for these. Come in 3 different coulors and delivery is free. Always worth having a decent quality helmet! The very popular HJC R-PHA Motocross helmets are back with a revived collection of designs and graphics and the Silverbolt is part of this new range. 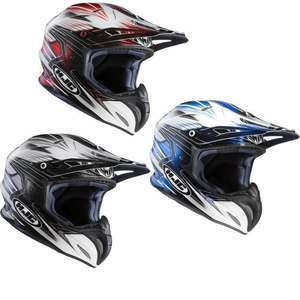 If you are looking for a high specification off road Motocross helmet that looks sleek and stylish then the HJC R-PHA X Silverbolt Motocross Helmet is a high quality off road helmet which would make an excellent choice. Packed with amazing features such as COOL4EVER interiors, Premiuim Integrated Matrix (PIM) Construction and an optimised ventilation system, designed to work with its aerodynamics, this lightweight RPHA helmet offers superb protection and comfort with a contemporary, modern, superior look. Get yours from GhostBikes today! I bought one of these a few months back when they were £150, and I thought that was a great deal, but this is even better still. Good lid, and I'm very particular about my lids. Great quality product and long lasting needless to say it is an absolutely great deal price wise as I bought this particular one for 170!!! Great price for a decent offroad lid! OK if.you are only using it off road....looks daft if using it on the road. Normally moped boys wear them.